Relax by the fireplace while you enjoy your stay. For the thrill seekers skiing or snowboarding is available at The Arizona Snowbowl, just over an hour away. After you've explored the beauty of Northern Arizona return to your room for a relaxing massage or just unwind in your own Jacuzzi tub*. Then, wake up rejuvenated, and enjoy our fabulous wholesome Breakfast. Not available with other specials or discounts, third party bookings, prior bookings or holidays. 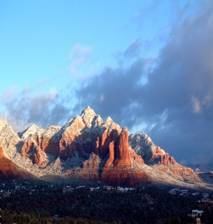 Package includes best available King rooms excluding Red Rock Crossing and Mission Grande. Call 928.204.1942 to inquire about availability. *Jacuzzi tubs available in Select Deluxe King Suites only.